On the Penninghame Process we often talk about the importance of growing in awareness and connection. Here we share why we say this, how growing in awareness really benefits your life, and how you can do this every day, without feeling overwhelmed by yet more things to add to your daily practice. Growing in awareness simply means developing the practice of bringing enquiry and attention to your thoughts and feelings as they arise, and we can easily do this as part of our everyday lives. By practicing awareness of our thoughts and feelings, we come back into connection with ourselves. It’s the first step towards not getting lost in the drama of our feelings, or a situation. Without awareness, we may think that a particular person or situation is causing our negative thoughts or feelings, but when we pause and observe the destructiveness of our own thoughts, we get to see the reality, that it is not others or the situation that are the cause, but simply our own thoughts about that person or situation, which are creating the feelings or outcomes we don’t want in our lives. Once we become more aware of the thoughts we have running, how they are making us feel, and what they are attracting and creating in our lives, we suddenly have a choice that we were not aware of before. So practicing simple awareness, and growing into this practice so that it becomes part of our automatic response to challenges that arise, is really a way of cultivating a practice that helps us bring more of what we want to think, feel and create in our lives. It doesn’t all have to be all about focusing on the negative either. Bringing our awareness to both positive and negative thoughts and feelings helps us to create more of what we want. What we think about, we attract more and create more of in our lives. So if we bring more awareness to when we feel happy, to what there is to be grateful for, or to the positives thoughts we have about ourselves or someone else, we will naturally nurture and grow those types of thoughts and feelings, and so they become more of your natural state of being. It really is that easy. Observe your thinking, and then make a choice. But we know that our minds can make it more complicated and put barriers in our way that make it difficult to take a step back and make a conscious choice. So here are 5 Simple daily practices that will help you to make that choice, and naturally grow in awareness every day. Wouldn’t it be nice to have a built in road map for your life, that automatically re-routes you and guides you back in the direction you want to go whenever challenging moments arise or you slip into unawareness or into negative thoughts or feelings, and get diverted off track? Having a vision for your inner state is this guiding compass, your inner GPS. Having a vision for your inner being, is to have something which sets out how you really want to experience life. Making this vision part of what you consciously choose each day, is a simple practice that will cultivate something inside of you that naturally crops up just at the moment you need it, brings you back into awareness, and reminds you of the direction you really want to take. Try saying to yourself each morning…..today I choose to live in joy and peace, or whatever else resonates with you and how you want to experience life, and notice how many times during your day this intention crops up and brings you back into your awareness when you are going off track with this intention. Growing in awareness doesn’t need to be difficult, in fact it can feel like a nice break. Take a few moments each day to take a break from everything that is going on around you, and just sit with yourself and observe….what are you feeling physically, emotionally, and mentally. This may seem strange at first, but so often we just go through our day reacting to thoughts, situations, people, events, and we know that we don’t feel good, but we either just react unconsciously, or accept it and live with it. You can do this anywhere… in the toilet, in the car, at your desk, in bed. Find a few quiet moments, close down your eyes, take some deep breathes and just listen to yourself. By bringing this simple enquiry into your routine when you wake up in the morning, or maybe on your morning coffee break, your conscious awareness of how you are feeling during the rest of the day will naturally grow. We don’t always have to do anything or fix anything. Quite often simply bringing our awareness to how we feel, acknowledging the feelings and allowing them to simple be there, can help you to make a shift, and you will be surprised how many intelligent solutions to problems arise, just by coming back into this state of connection and awareness. At the very least, you have come back to consciously observing your thoughts and feelings rather than being blindly run by them, and from there you have a choice. Do you go off road, or do you come back to your inn GPS and your vision? Let’s be realistic though, we will all still have moments when we get caught out, when life throws us a bombshell, or even just something simple happens that tends to send us off in a spiral of negativity. We don’t quite manage to automatically re-tune into our inner GPS, and we can’t quite get to grips with how we are feeling or what we are thinking just yet. This is where we just need to bring up our temporary stop sign! Rather than immediately reacting, simply give yourself a small pause. Taking this small step is already is making a conscious choice to move into your awareness, so you are on your way back on track. From here you have so many more options. Just by taking this pause, you will be more able to bring up tools 1 and 2. and once again, you have a choice. You could enquire… Am I getting lost in my thoughts and negative feelings right now rather than dealing with the situation at hand in the most effective way? You could take a moment to put yourself in the other persons shoes and have compassion and understanding for them. You could choose to drop any judgements about yourself or others that are not necessary or helpful. You might also begin notice regular patterns of negative thinking that you tend to fall into which you didn’t recognise before. All of this is great, and you got there from just first taking that pause. Now you have the awareness and you can feel empowered to take some conscious action to direct yourself back to your inner GPS. But remember, this doesn’t have to be a big exercise, and you don’t necessarily have to resolve the situation every time you take a moments reflection. Go easy on yourself. This isn’t about judging yourself or how well you deal with situations, but recognising that each time you manage to take a mindful pause, you are growing in awareness and connection, and the positive impact of doing just this will have in your life, will continue to grow. The more you do this, the more time and space you will naturally give yourself in situations which would previously have just felt too unpleasant for you to handle. It might happen little by little, but it will happen. We all need a little help to remind ourselves not to get lost in the daily grind, and any small thing that we can do to support ourselves and enhance our intention of growing in awareness, all makes a difference. Why not set yourself up with the best chance of bringing yourself back into awareness at any moment. Whether it’s using words like ‘BeHereNow’ in your passwords, having reflective questions like ‘where am I, what am I doing, how can I be more mindful of this?? as your screen saver, or setting alarms during your day to take your 3-5 minutes mindful-break. With reminders all around you, you will begin to re-train your consciousness to be more aware as your natural state of being. They may not work all of the time, but with the intention there and willingness to be open to these reminders when they crop up, many times the will, and it only takes one thought to bring you back into awareness and make a difference to your day. We’ve saved the really good bit until last. This is where you get to hang out in feeling good, to practice nurturing what is good about life, and enjoying those feelings more and more as you do. When we bring our awareness to what we are grateful for or what makes us happy, we will naturally become more aware of all of those things, and so bringing more of these feelings and experiences into our lives. At some point during your day, practice reflecting on 5 things that you feel grateful for. Take a moment to really feel the experience of having this person, thing, animal, relationship, or whatever it is, in your life. Don’t get hung up on all the things in life you don’t have, or the things you wish were different, this is not going to feel good. Focus on what you do have, there is always something. It could be something as simple as enjoying a nice refreshing glass of water. Enjoy this time spent growing in awareness of all there is to be grateful for, knowing that not only does it feel good right now, you are also growing in awareness and bringing more of this into your life. Penninghame is very pleased that The Camp will be using Penninghame House and Estate as the new Scottish venue for their boot camps. The first camp at Penninghame starts on the 30th June, with future dates in 2012 being 28th July, 15th September and 6th October. 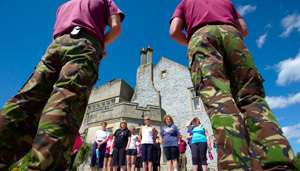 The Camp is the UK’s original boot camp (established 2007) and are consistently praised as the most unique and successful week long weight loss and fitness holiday camp running in Europe. The boot camp courses are tailored and designed with specific weight loss, fitness and toning goals in mind. For more information visit The Camp website or phone 0800 3357672. We are delighted to offer a very special Demonstration and Dine evening at Penninghame House Cooking School. 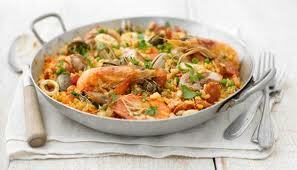 Our visiting Spanish chef, Ioel Ezkurra, will be cooking for the evening showing how to make authentic Spanish food. Ioel has worked in several restaurants in Spain and Europe including some Michelin starred establishments. Enjoy a glass of spanish wine while you watch Ioel cook your dinner. You will get to taste a selection of tapas before you retire to the dining room for dinner. 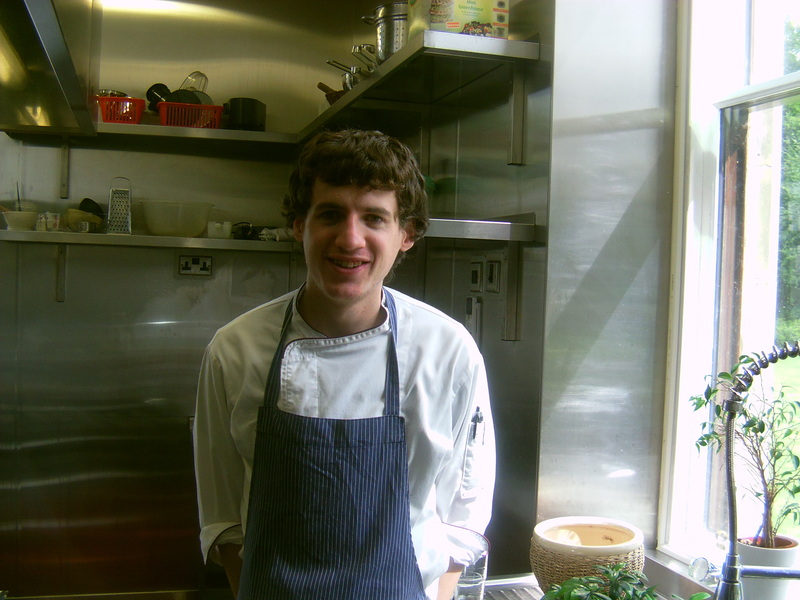 Enjoy a restaurant experience whilst learning new cooking skills. Price per person is £40 which includes a selection of tapas, main course, dessert and wine. Accommodation is available please email info@penninghame.org or telephone 01671 401414 for more details and prices. What an amazing, life changing experience this has been.